Lovat Shinty Club outside the old building. It is one of the world’s heartlands of shinty with a great tradition in the sport. 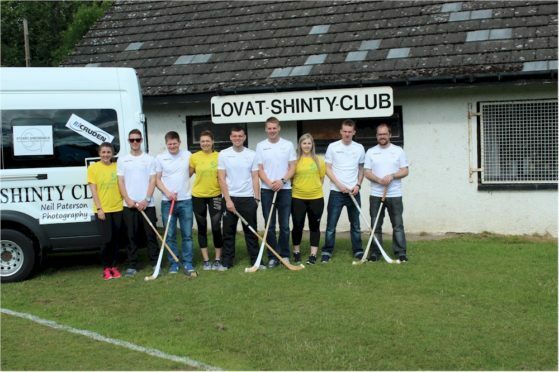 And now, Lovat Shinty Club has found the last piece in the funding jigsaw to create a clubhouse for the future. Ground works for the new sports facility is about to get underway after Lovat received £129,000 in vital funding. The Lovat Shinty Club received £129,369 by Highland LEADER Programme to begin building a new sports and recreational pavilion. The centre, replacing the current cuilding at Kiltarlity, near Beauly, will provide changing rooms, social space and treatment rooms and is set to become a community hub for locals. John MacRitchie, chairman of Lovat Shinty Club said: “The current pavilion has fallen into a state of disrepair and is no longer fit for purpose. However, the new pavilion will allow us to accommodate additional members, host more shinty games/community events and increase the coaching opportunities we offer school children. The contract for the new pavilion project has been awarded to local building firm I&K Ferguson. David Godden, Chair of the Local Area Partnership said: “LEADER aims to promote economic and community development within rural areas and is a great source of match-funding to enable a wide range of projects to be delivered. Norman Grant, Chairman of Kiltarlity community council added: “It’s a great thing for the community. There is a lot of support for Lovat Shinty Club so to build a state of the art club house with changing rooms, it will certainly benefit the community.